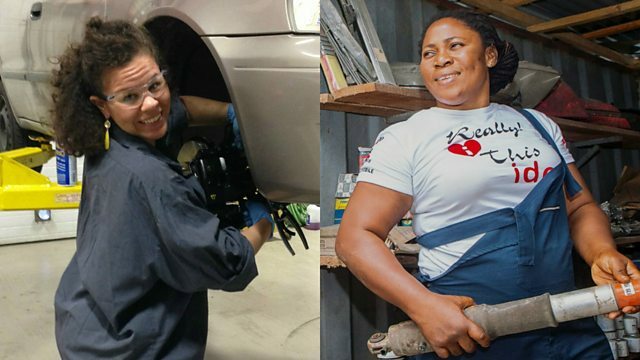 Nigeria's first female mechanic and an American mechanic want women to get to know their cars so they do not get ripped off at the repair shop. Patrice Banks says she was an 'auto airhead' before she fell in love with fixing vehicles. She was an engineer for a big chemicals company, but despite her passion for problem solving she avoided her own car maintenance and preferred to pay a man to do it. The Philadelphia born mechanic discovered that many other women felt the same way and decided to do something about it. Patrice started work in a garage, went back to school and set up Girls Auto Clinic to help women feel more connected with their cars. Nigerian Sandra Aguebor got her first job in a car repair shop aged 13 and has never looked back. Sandra did not let the jokes and jeers about being a girl doing this job get to her. Now Sandra is famous for being Nigeria's first female mechanic and has run her own garage, Sandex Car Care, for 20 years. She also leads the Lady Mechanic Initiative, which trains women to work with cars.